We would like to thank all who have joined us for our festive Open House events. We had so much fun and hope you did too. If you haven’t been, don’t fret, there are two more Open Houses – this Saturday, December 1st and next Saturday, December 8th. Saturday, December 1st in the Studio and Cheese Department from 11 a.m. to 3 p.m.
Tis the season to enjoy beautiful Italian foods! In Italy Natale is an exciting occasion centered around delicious foods. At this time Italians will enjoy best-loved family recipes and dine with friends and family for what is an especially merry occasion. Special guest Jesse from Jesse Tree, along with Cathy and Herma, will be in the Studio presenting special Italian foods. Come by and be amazed by our 5 foot Salami, lovely Panettone cakes and other delightful foods. They will also be serving pasta from a hollowed out wheel of Parmesan. Mmm…Delizioso! We hope you will celebrate Christmas with us this Saturday – the Italian way. Other beautiful Italian cheeses and meats will be served in and around the cheese department. Two special mentions are Moliterno al Tartufo (a pecorino with black truffles from Sardinia, a real show-stopper!) and Emozioni (a cow and buffalo milk cheese drunk with wine). 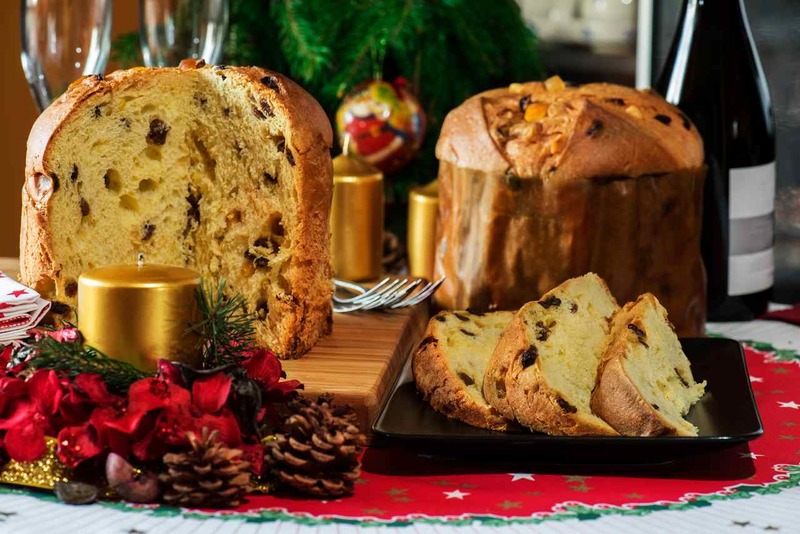 Panettone cakes are an awaited Christmas tradition for all Italians. Christmas time in Italy means an abundance of sweets and cakes to be shared and gifted to loved ones. The most popular by far is Panettone. Panettone is a sweet Italian Christmas cake that dates back to the 15th century. At Herma’s we are proud to represent fine Italian bakeries by offering their beautifully packaged and delicious, festive cakes. Herma enjoys a slice on Christmas Day with a glass of Prosecco and thin slices of Gouda. Gift Ideas for Christmas – To cook with love! This Christmas delight the chef or cook in your life with superior cookware from Herma’s! Zyliss Food Processor will mix, chop, blend and puree just about any food by simply pulling a handle. Zyliss Food Chopper and Dicer quickly cuts up fruit and vegetables in its cup or on a chopping board. No gift is more exciting to receive than that of a gift basket all filled with fine foods and goodies. Herma has been creating them for clients, colleagues, friends, family and neighbors for over 25 years and they are truly stunning. Be sure to order your gift baskets for Christmas NOW as Christmas Day will be here before you know it. Also be sure to order your cheese tray for holiday entertaining. 24 hour notice is appreciated. For both baskets and cheese trays call 905-885-9250 or stop by. We look forward to seeing you this Saturday and in the coming days.